The Club Northwest Youth Team is for athletes ages 9-18 of all ability levels who are interested in practicing track and field during the summer and achieving their personal goals. Practices will be held Mondays and Fridays from 4:00-5:00 with athletes encouraged to attend the Wednesday Club Northwest All-Comers Meets. Practices start June 17 and end August 12. Each member of the Youth Team will receive a free Club Northwest t-shirt and the opportunity to purchase a Club singlet at a reduced price. All practices will be held at Woolsey Stadium at King’s High School 19303 Fremont Ave North, Shoreline, WA. If you have never been there, it may be helpful to look at google maps to see where the track is on the campus. Parking will be above the stadium, the first parking lot you encounter as you head toward the track. Parents are welcome to stick around during practice and get their own workout in at the track or run on the on-campus trail system. All practices are coached by Rod Wilcox, who has been coaching track and cross country at King’s High School for over 25 years. Rod was a high jumper at the University of Washington who went on to have a successful athletic career as a masters decathlete. 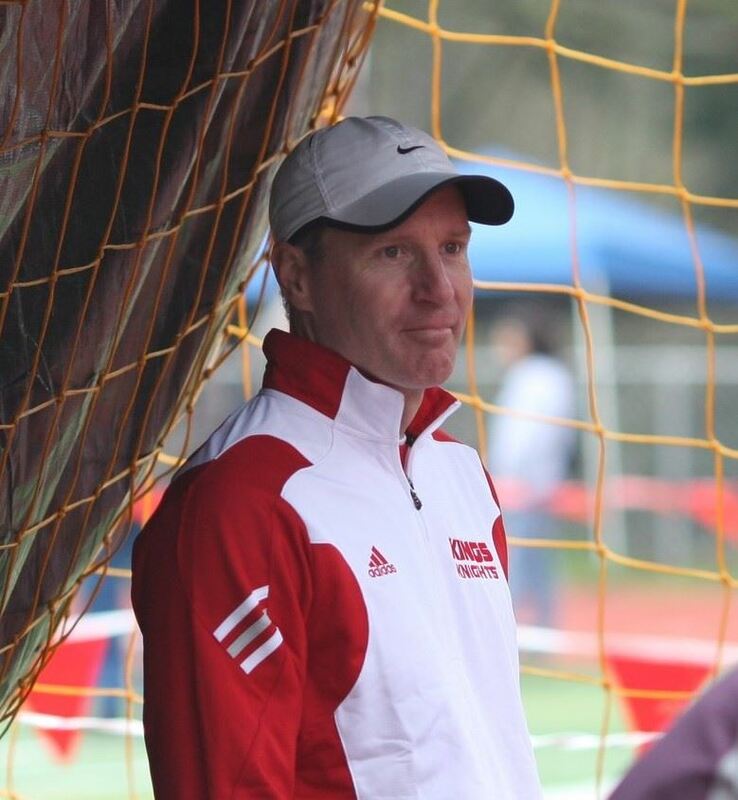 Rod’s experience in both coaching and competing in all of the track and field disciplines gives him a well-rounded background that allows him to provide knowledgeable coaching to the youth team. Rod brings a very positive attitude to practice and is ready to help the athletes achieve their personal goals, whether it involves competing at championship summer meets, setting personal bests at the all-comers meets, or just trying different events to see what they like best. To see Rod's full bio click HERE. Please contact Rod Wilcox directly at rwadew@frontier.com. Registration will be online at clubnorthwest.org (please see our membership page). Each athlete needs to be a member of ClubNorthwest, either as an individual youth team member or as part of a family membership. Each athlete will need to have a waiver signed by their parents. Parents working out at the track will also need to sign their own waiver. Youth Team Practice Fees: $225 for the whole summer or $125 per month. Club Northwest Membership: $30 for an individual youth team membership or $75 for a family membership. Youths already covered under a family membership do not need to pay any additional Club membership fees. If you aren't a member yet, become one HERE. All-Comers Track & Field Meets: Season passes for Club members are $30 and can be paid in advance through our website. The single meet entry fee is $5 for Club members. Check the Club Northwest website for additional information on meet times, location and schedules. All track meets are optional. Athletes can choose to attend as many or as few as they desire. Club Northwest All-Comers Series - Wednesdays May 29 - August 14 at Shoreline Stadium. USATF Pacific Northwest Junior Olympic Association Championships, June 21-23 Mt Tahoma HS. Learn about some of our standout athletes! Woolsey Stadium at King’s High School 19303 Fremont Ave North, Shoreline, WA. The Club Northwest Junior Youth Team is for athletes age 4-8 who are interested in learning more about the sport of track and field and trying a variety of events. Practices will be held Mondays and Fridays from 2:00-3:00 with athletes encouraged to attend the Wednesday Club Northwest All-Comers Meets. Practices start June 17 and end August 12. Each member of the Junior Youth Team will receive a free Club Northwest youth-sized t-shirt or singlet (we are still working on the logistics of youth singlets). Registration will be online at clubnorthwest.org (please see our membership page). Each athlete needs to be a member of Club Northwest, either as an individual junior youth member or as part of a family membership. Each athlete will need to have a waiver signed by their parents. Parents working out at the track will also need to sign their own waiver. Junior Youth Team Practice Fees: $175 for the whole summer or $100 per month. This will be a weekend of running through beautiful scenery in Moran State Park and Eastsound on Orcas Island and of celebrating all that goes into a well-balanced running lifestyle. Along with running, there will be opportunities to swim, bike, hike or to just sit back enjoy some R & R surrounded by fellow runners and friends. We will also be hearing from athletes and experts local to the Northwest. The women of Club Northwest are organizing this event, but it is open to all Northwest women who are passionate about running across all ages and ability levels. There are no speed requirements and we will plan running routes that accommodate those hoping to go longer (10 + miles) or shorter (5 + miles) so that everyone can take part. We will also include non-trail running routes around Orcas for those who prefer roads over trails. *Pricing includes lodging and all meals outside of Friday dinner. 1. Retreat attendee with dormitory style sleeping arrangements. 2. Retreat attendee with private room sleep arrangements. 3. Retreat attendee at student rate with dormitory style sleeping arrangements (full time students). 4. Retreat attendee with campsite sleeping arrangements (must provide your own tent). There are three phases of registration. Prices increase on May 1st, and July 1st. It is our mission that everyone interested in joining for our retreat is able to attend. Student pricing, as well as full and partial financial assistance options are available. To learn more, please reach out to agarvue@gmail.com. 08 Mar 2014 CNW Annual Meeting: it's party time! 01 Feb 2014 Volunteer @ The Northwest Runner Booth! 09 Mar 2013 CNW Annual Meeting: it's party time!